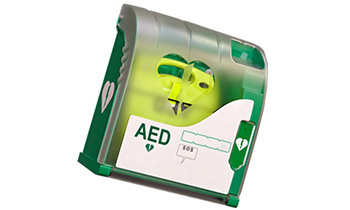 An Automated External Defibrillator (AED), is a increasingly comon sight in both workplaces and public enviroments, many schools, shopping centers, and Golf Centers have one. These are devices are self contained units that have a internal computer that may assist a person who has had a cardiac arrest and is not breathing. By delivering and electric shock to heart to "stun" the heart to restore normal electrical function and cardiac output. The Health and Safety executive has recently given guidance on AED and listed scenarios where the use of an AED maybe beneficial. The Health and Safety Executive recommends that all persons who may be called upon to use AED in a Emergency are trained in its SAFE and CORRECT operation. Lifesaving equipment is only as good as the person using it, therefore training should be provided. The First Aid Kit, Level 2 Automated External Defibrillator (AED) & Basic Life Support (QCF) course is designed to allow a person with no First Aid Training to operate an AED effectively and safely. This course can also count as part of an annual refresher training for existing staff who have a current First Aid Qualification.